Can anyone help me try to find the different service plans offered by China Telecom? Is it me or is this website just worthless? It is not you, the largest Telecoms provider in China can’t even figure out a decent working website, and internets is their business!! Bringing this thread back from the dead. I just got myself a apartment (hurrah! goodbye prison cell dorm room!). It’s in JinJiang. My apartment building allows me to choose my internet service provider so I’m shopping for the fastest/most reliable ISP (willing to pay up to 200RMB/mo). 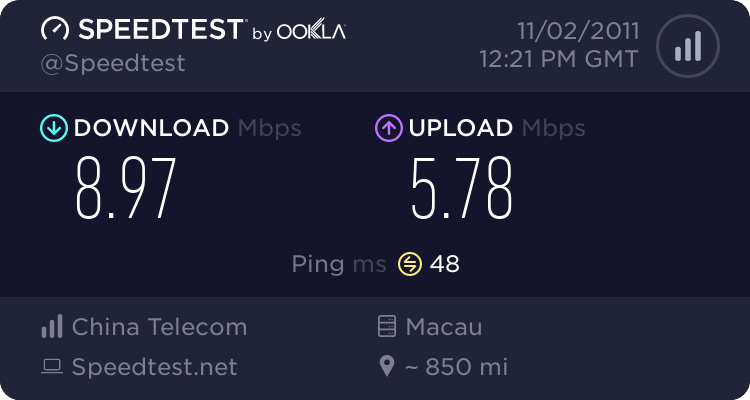 Could you all be so kind as to speedtest.net your connections again? And perhaps list your location. I’m assuming that China Telecom is still the best. I don’t really know how to research this matter. The apt lobby had flyers for Aipu ISP. 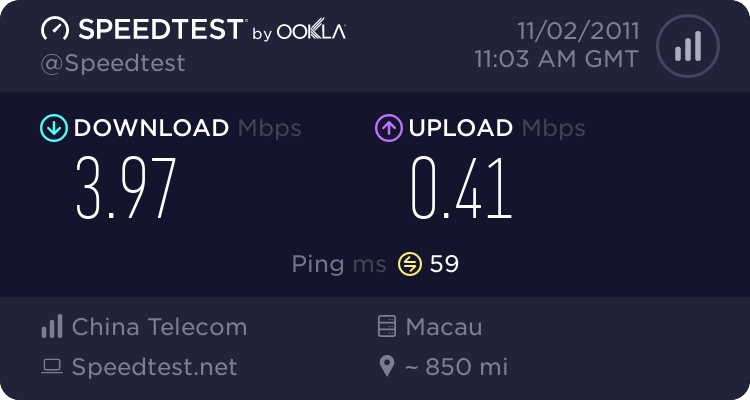 4Mb down for 90RMB/mo (if signed up for a year). Ziich, congrats on the new pad! Housewarming party soon? RE: internet speed, you guys would be shocked at what i’m hitting. Glacial aint the word. 0.1 ks is not uncommon. Sometimes i make a coffee and come back, still waiting. Even a troglodyte struggles with this speed…. Telecom still gettin it done! Internet is faster at my home than in my office in the software park, no joke. Not to say that my home internet is fast by international standards but I routinely max it out at 500 kb/s on bit torrent and ordinary downloads. The cost is 120 / month. I wouldn’t even mess with Aipu, and definitely not with Great Wall. Apart from the speed, i’m pretty satisfied with China Telecom’s service. My repair/service guy comes out every time, helps me out, sometimes laughs at my computer -illiteracy, is friendly, and I never pay. I’m sure he has a laugh with the wife about this foreigner and his old computer…. Here’s mine 7:00pm with China Telecom. I usually max out around 300-400 kb/s with torrents, I think we paid around 450 RMB for 3 months. Definately make sure they give you the 4mbps. 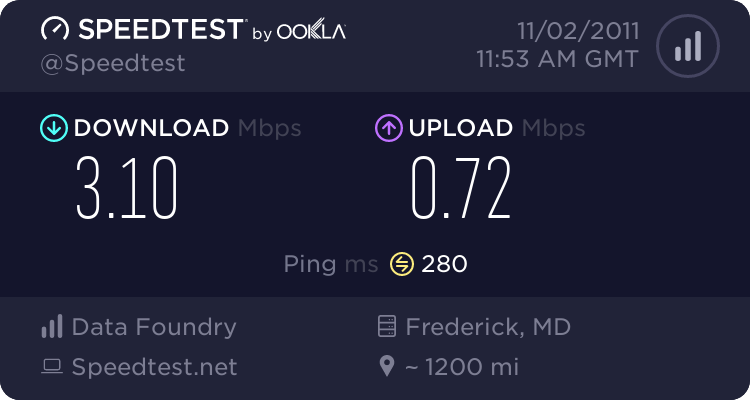 Apparently near Vincent, though currently VPN’d to the DC area. Will post without VPN later. I’m not too sure of the accuracy of these tests as I’m currently getting just below 1MB/sec (which would be 8Mb/sec) on a download. 1.5MB/sec is the highest I’ve ever seen here, but lots of times I’m lucky to get 500KB/sec. Here is my result without VPN. what the!!!! What China Telecom plan are you using?! Chris – my co-worker has Aipu and said it is painfully slow. Probably not worth it. Thanks for the love yall. @7: W. T. F. mate. Info plz! Seriously, what kind of internet plan do you have? 1.5 mb/s in Chengdu is faster than anything I’ve ever seen or heard of here. I know they have 20mb connections available but they cost 5,000+ kuai a month the last time I checked. Sorry guys, I really don’t know any details about the plan. Essentially, my building has the plan & I basically sublease from them. Where do you live? Is internet included with your rent or is that separate? If it’s the latter, how much are you paying?